ARE YOU A GOOD WITCH, OR A BAD WITCH?? Poor Dorothy doesn't know WHAT to think!! She knows she's not in Kansas any more. But all this witch talk? Not only is she not a witch, she declares that witches are "OLD and UGLY", to the amusement of the Munchkins, who are, well, still hiding in the Munchkin Land "bushes". 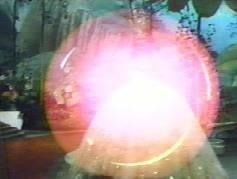 Glinda calls the Munchkins out of the bushes and sings them a song about falling stars named Kansas. And meet the young lady who fell from a star. When she fell out of Kansas, a miracle occurred. And oh what happened then was rich! The kitchen took a slitch.